The sun is yet to rise in the east, the early morning wind is filled with the rhythmic beats of drums and the “thottam” song waking up the people in the village, the chief dancer is ready to perform the “Theyyam” after a short interval. Theyyam is an art form with a rare combination of dance accompanied by the musical instrument chenda, which reflects the origins in a tribal culture. A very popular and outstanding ritual art form of northern Kerala especially now found in the border districts of Kasaragod and Kannur. It is usually performed during kaliyattam, which starts in the month of November or December. As a living culture with centuries old beliefs, rituals and customes, it embraces all most all the classes of the Hindu religion. Based on the sangam literature its origin can be traced back to about 1500 years. It has also been mentioned in Jain and Buddhism texts. After the Aryan invasion, it has undergone radical changes, a large number of brahmanical gods and goddesses have infiltrated to form a separate following of the Theyyam. According to famous historical book “Kolathiri”, Parasu Rama introduced the festival of Kaliyattam to the people of Kerala that lasts for three to four days. It is he who assigned the responsibility of Theyyam to the indigenous communities like Velan, Panan, Malayan and Vannan. Theyyam is generally performed during the occasion of Kaliyattam in front of the Tharavadu or Joint family house and in Thanam or the village shrine. Usually it is performed in an open theatre. Before the performance as a part of ritual the chief dancer who propitiates the central deity has to observe vegetarianism and must reside inside the “aniyara” or the green room and he has to finish his supper before the sunset, this aspect is probably derived from the influence of Jainism. There are different stages in a Theyyam performance. The first part generally begins with “Vellattam” which is performed in the night with less make up and without heavy costumes. Only a small headdress is worn on the chief dancer head. During this occasion the dancer along with the drummers recites the song, which describes the myths and legends of the deity on which he, is going to perform. These songs often related to the local history. Narration includes the heroism and tragic tale of these deities. For instance Makkam was considered to be the tragic and immoral women by her beloved brothers.. The jealousy of their wives made her a victim of suspicious and made them to dump her into a deep well and later she was elevated as a chaste woman. After finishing this primary ritualistic part the dancer returns to the green room. After a short break he reappears with proper make up which includes reed or green colored costumes and face paintings. These costumes includes a gown made up of leaves which may also include those of the coconut trees, tazha Adai, muti or headdress and other body decorations. As with the Yakshagana, these are prepared by a craftsmen who possess a good knowledge about primary and secondary colour. Then the chief dancer comes in front of the shrine called as “sthanam ” and gradually metamorphoses as the particular deity of the shrine. After observing certain rituals it is the time to put on the headdress. Then he dances with the rhythms of musical instruments like the chenda, kozhal tuti. Normally the central deity is accompanied by a number of dancers who dance with him with shields and swords. Now that’s what is a face painting!! The dance has different types of steps known as ” Kalasams” and each Kalasam is repeated systematically. 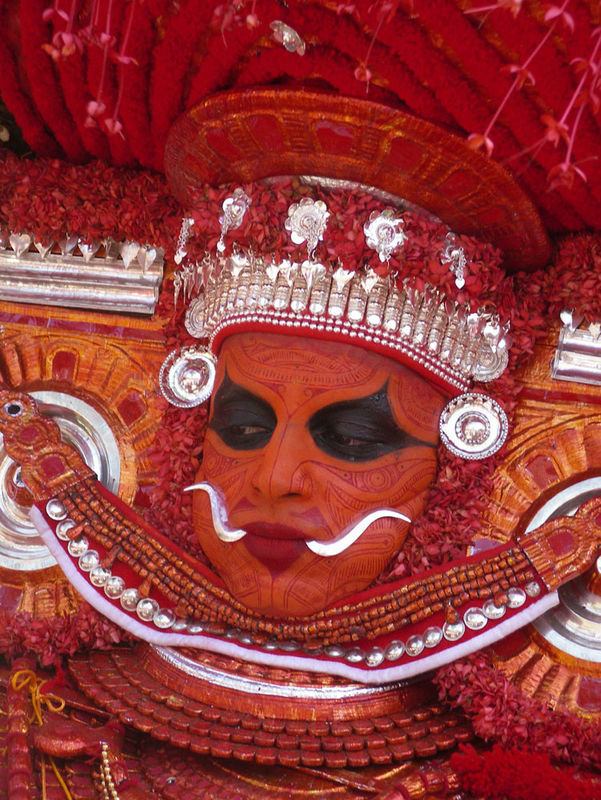 A Theyyam performance includes the combination of vocal recitation, background musical instruments, dance and totally different make up and costumes. To become a good performer one has to master the skill of dancing. It is imparted through the Gurukula System at a very early age of seven to eight years. Morning hours are used for instruction. Good training in “Kalaripayattu” is must for the artist who performs the role of hero deities. The eminent dancer teaches his sons, nephews and relatives. In certain dance items like Muchilot Bhagavathi, Kankattu Bagavathi the dancer has to wear burning wicks around his waist and observe fire walk. In that case he has to master the method of weight distribution by moving the legs, shoulder and hands. 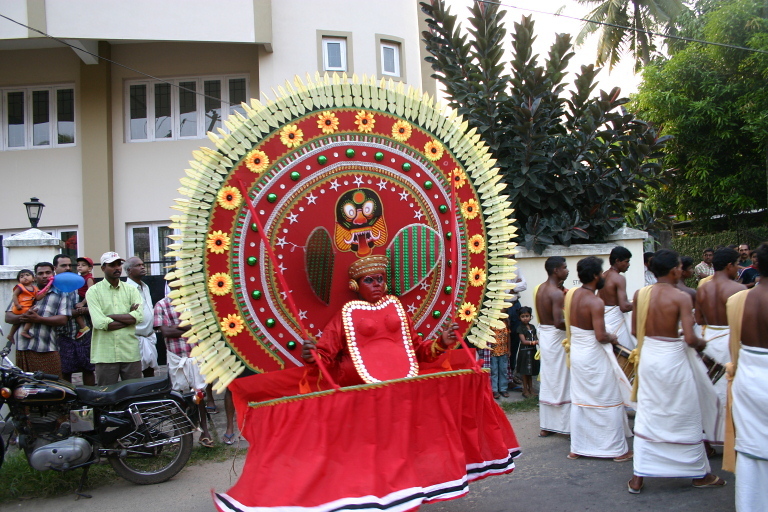 As a powerful social instrument Theyyam is mainly intended to propagate Hindu mythology among the rural masses. This continued patronage of this ritual among the masses makes it one of the most popular ritual art form of Northern Kerala especially Kasaragod.